Shiny, red, stainless, and built like a cannon. Yep, it IS like magic! A table full of links! It’s good to have help! So we made two batches of sausage this week: chicken sausage with tomatoes and basil for Sunday family dinner, and a basic garlic sausage for a pot luck dinner party last night. This was my first try at Ruhlman/Polcyn’s chicken sausage, but it comes highly recommended (when Ruhlman says it’s his favorite sausage in the book, it’s worth taking note). It wasn’t my first poultry sausage. 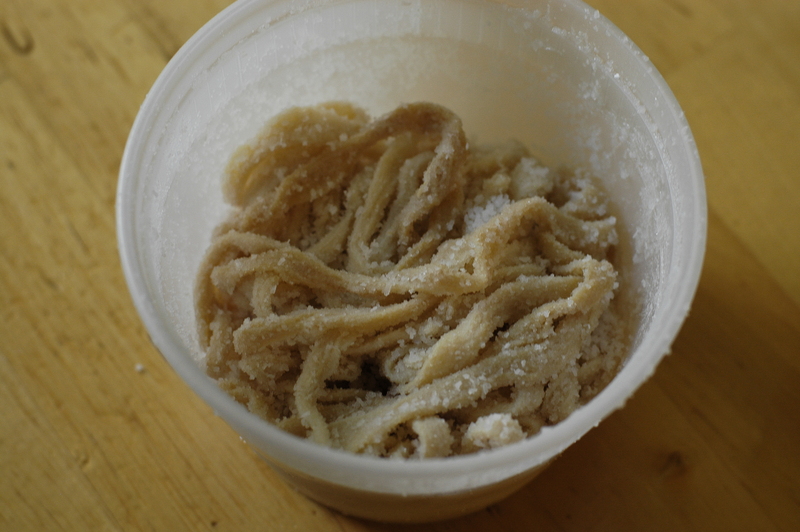 I made a batch with goose and pork back in January, which I was really happy with. 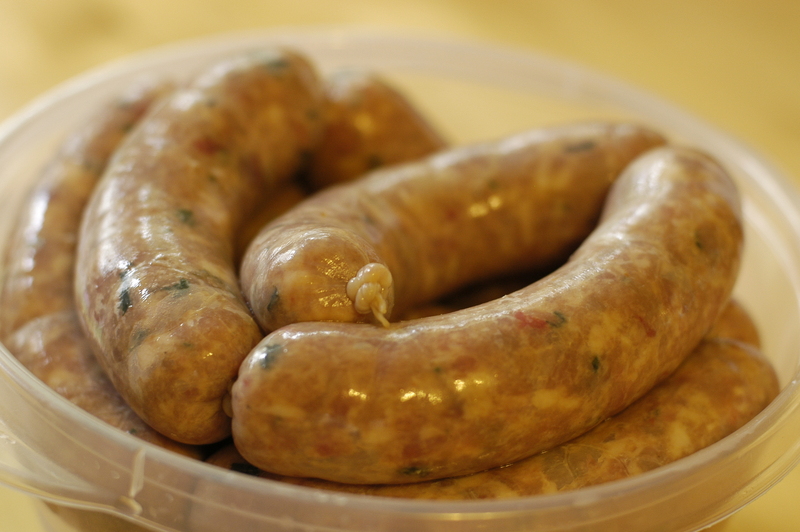 And the garlic sausage is a house favorite, even better if you’ve got time to smoke it after casing, when it becomes one of the best pizza toppings ever. So first, the chicken sausage: I’m having a hard time finding fatback locally to cut into the sausage grind, so I added a 2lb piece of pork belly instead into the mix along with 3 lb of chicken thighs. 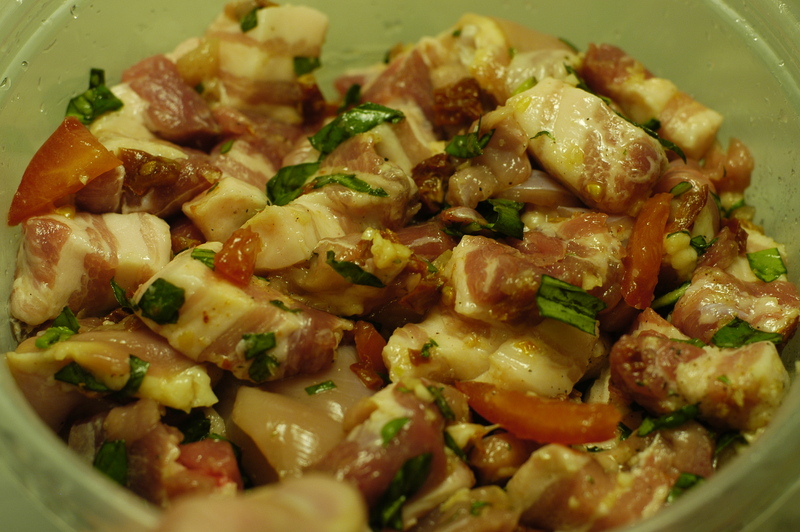 Other than that, I followed the basic recipe from Charcuterie. Dinner was a food blog special: penne with Heidi Swanson’s Five Minute Tomato Sauce, and a variation on Gluten-Free Girl Shauna James Ahern’s Multigrain Bread (we make it in loaf pans, and with honey and millet added it makes awesome toast). 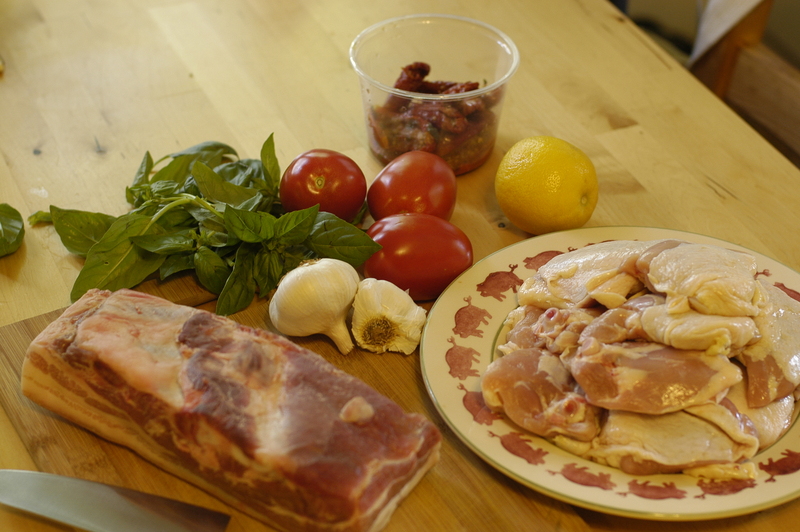 A great and simple meal, not terribly original, but balanced with complementing flavors from the tomato, basil, lemon zest (Heidi’s touch), and chicken. I’m very happy that there’s still a pound of links on hand in the freezer to use over the next month. So, it was a fairly productive afternoon. And maybe we’re laying the groundwork for a future helper in the kitchen. Who knows? This entry was posted in charcutepalooza, chicken, pork, recipes, sausages, technique and tagged charcutepalooza, chicken, cooking with kids, pork, sausage. Bookmark the permalink. 11 Responses to What’s gonna work? Teamwork! 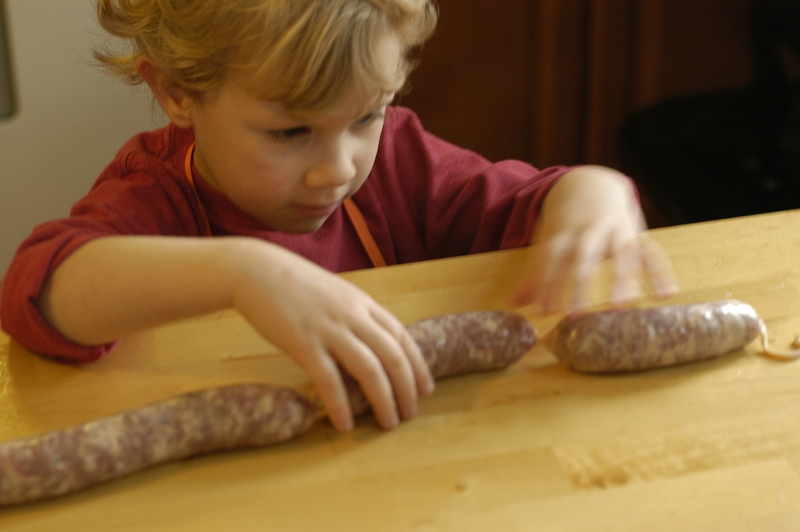 Sausage making is great work for kids. My daughter enjoys putting meat chunks in the grinder and always helps with stuffing. During our last batch of sausage she came up with the idea of making the links into letters. Her name, Lil, is relatively easy to spell with a string of links. Nice! 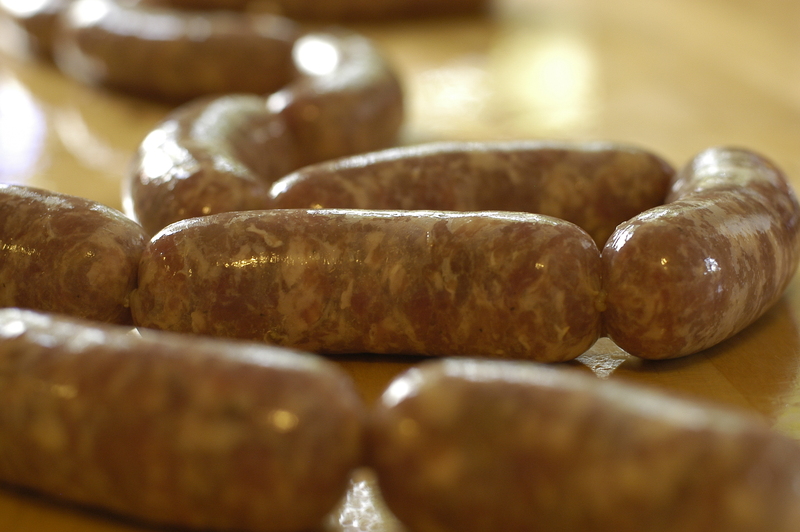 We have some initials that we could totally spell out with sausage. Why didn’t I think of this? Sorry about passing on the Wonder Pets tune. It was in my head, and you know, when it gets in there, it stays there! Hi Scott. Paul tells me that you will be doing the Masters in Sci Ed at MSU. Is that Right? My husband, Jason is heading into his second summer out there. Hi, Em. Yes, I just started 2 classes online this week, and I’m looking forward to the program. (If he’s got any suggestions on classes to take, have him send me an email.) And I won’t be heading out to MT this summer, but I think next year that’s going to be the plan, probably bringing the family out too. Should be fun. 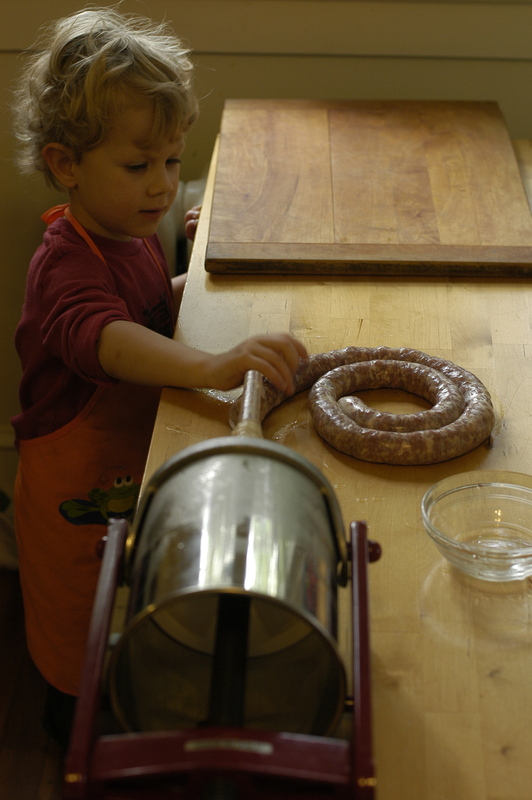 I agree that sausage making is a great activity to do with kids. I’ve made sausages before with a young family member, and not only did he do most of the stuffing himself, it actually got him to eat chicken, which he previously hadn’t! 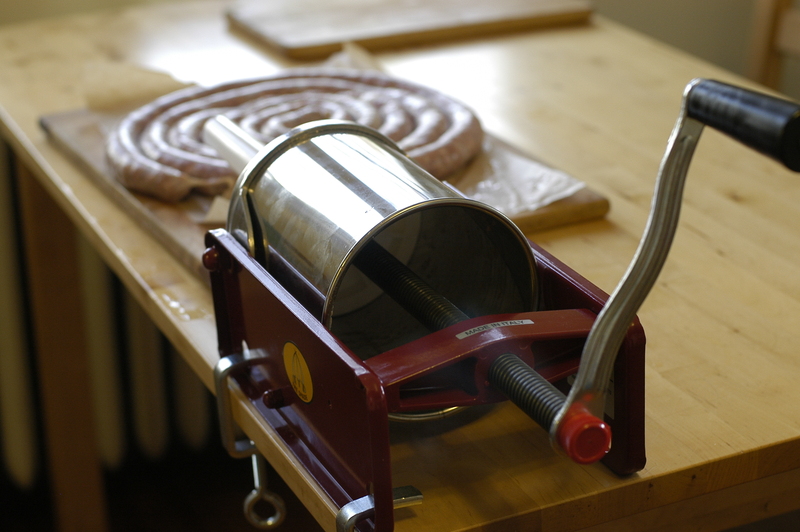 I’m also envious of your sausage stuffer – I”m getting quite frustrated with the kitchen aid attachment – love the grinder, don’t like the stuffer. 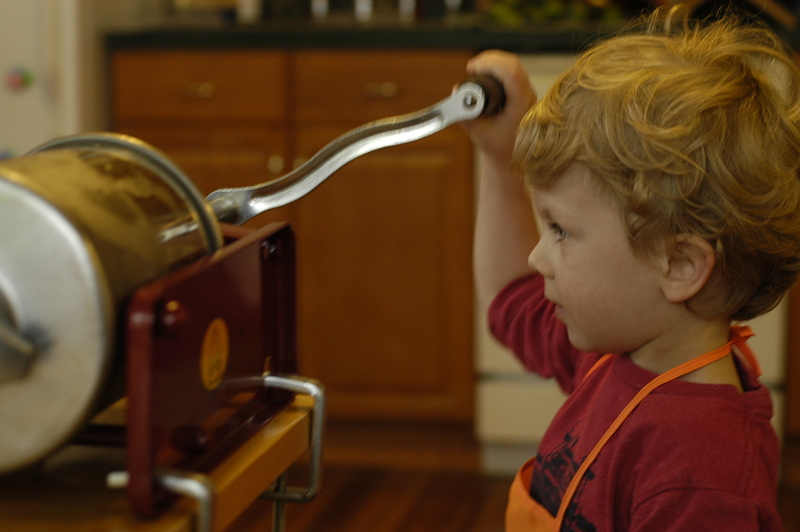 You win for the cutest sausage stuffer. Great post. Also have some stuffer envy…. I too have started reducing recommended amount of salt in my sausages and I love salty food. Thanks! We’re pretty fond of the stuffer and the helper!